Animated GIF Banner Maker is a program for creating banner and animated GIF for graphics files. It is designed by NuGraph Inc and detailed below are some of its main features. Supported formats: creating the banner or the animated GIF can be performed via the following image file formats: *.bmp, *.gif, *.jpg, *.tga, *.png, *.ico, *.wmf, *.emf, *.sgi, *.dib, *.icb, *.pcx, *.pcd, *.psp, *.pbm, *.pgm, *.psd, *.ppm, *.psg, *.vst, *.vda, *.tif, *.wbmp and *.rle. These formats are one of the most used in graphics. Conversion: another feature enables to perform conversion from one file into another. 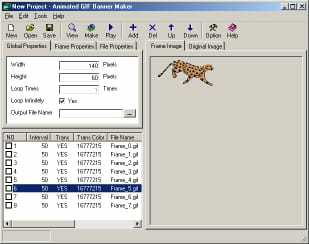 Animated GIF Banner Maker can convert an AVI file into GIF and also a GIF file into AVI file format. Creation: users are given several tools for the animation creation. Animated GIF Banner Maker helps to adjust the height and width of the animation as well as the number of times it is looping. The transparency colour can also be customized. Hard disc space required: 5 MB of free hard-disk space for program installation and 100 MB of free hard-disk space for temporary files using. Animated GIF Banner Maker is particularly easy to use. The interface is intuitive and graphical. This version expires after 15 days of use. Latest update on November 20, 2016 at 01:28 PM.